We already posted a few tutorials on how to add related posts widget with thumbnails in Blogger with summaries or only titles, which can be compiled into a single All-In-One Widget with powerful options. This new customizable related posts widget for Blogger integrates all the features we've seen before and more, such as thumbnails (square or round), post dates, excerpts, display only titles / thumbnails. Now let's see what this related posts blogger widget has to offer. The related posts widget recognizes post thumbnails uploaded through Blogger itself (or Picasa Web Albums), other images from Photobucket, Flickr, or other non-Blogger hosts will not be supported. This widget is compatible with the standard desktop Blogger templates except Dynamic Views, which does not accept customization. The script does not work on private blogs, so your blog / site must be open to the public in order to show. Log into your Blogger dashboard, go to 'Template' and open template editor by clicking the 'Edit HTML' button below 'Live On Blog' preview. 1. 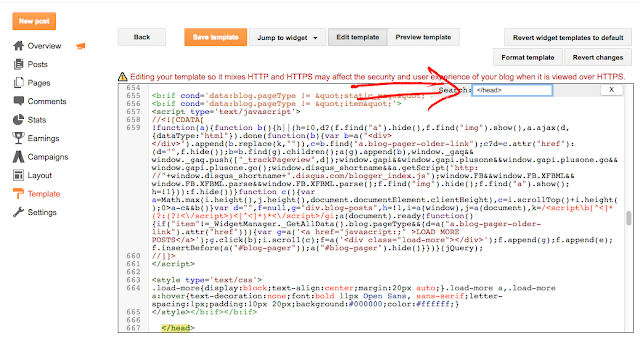 Place your cursor on the template code. 3. Press CTRL and F at the same time (PC) or Command and F (Mac). The search box will open in the upper right corner of the template editor. Type </head> in the search box, then press ENTER. This will take you to the </head> tag in your template and highlight it in yellow. Once you found it, click the small arrow not beside it but with one level above to expand code and scroll down until you see </b:includable> - right below this tag, you should see the line including the "postQuickEdit" id. How to Customize the Related Posts Widget for Blogger? Note: you may need to change the percentages in the CSS styles above in order to make posts fit the related container. Just follow the values in red and play with them until you get the best results. Note: 'w' comes from width, 'h' comes from height. To make the thumbnails square, change the 'h' (height) value and make it equal with 'w' (width) value. A higher value will result in more high-res images. Once you're done with the settings, click the 'Save Template' button and you're ready to see the related posts widget live on your Blogger blog. That's it! With the new customizable Related Posts widget for Blogger you will be able to add unique features to the related content section of your blog. However, all of these styles look and work slightly different, so take your time, and pick your favorite.